At the risk of redundancy, we are dedicating a second consecutive post to emphasize the importance of the Atwater Kent Museum archaeological collections recently transferred to the State Museum of Pennsylvania. Archaeological excavations in urban settings, like Philadelphia, can generate huge volumes of artifacts. Although there are a few obvious exceptions, the true value is not the artifacts in and of themselves, but rather the spatial context in which they are found. The potential information to be gained from the analysis of such collections provides a unique opportunity to compare, contrast and draw inferences about a multitude of aspects of urban life through time. With an ideal set of circumstances, the “where” of an artifact tells the archaeologist the “when” of an artifact, and the “when” with the right historical documents can tell us the “who” and so on. This is how reconstructions of past life ways, at least historical ones, can be created. Preserving the locational context, the provenience, is of utmost importance to maintaining the scientific value of any archaeological collection. This begins with accurate documentation recorded in the field and continues with a well organized catalog, site maps and profiles, photography, reports, etc. In a dusty run down warehouse on the north side of Philly, the material culture of the city’s early colonial through 19th century life sits in deteriorating paper bags and cardboard boxes crushed under their own weight, water damaged, many of them encrusted with pigeon feces. The product of decades of archaeological excavations required for federally funded infrastructure projects such as I-95, the Vine St. Expressway, the Commuter Tunnel, and others, these artifact collections were never properly processed to professional standards. 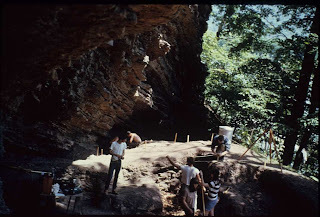 Curation standards, and Cultural Resource Management (CRM) as a whole, have come a long way in the past 40 or more years since some of these excavations were conducted. Unfortunately, these collections weren’t along for the ride. In those days the decision was made to store these artifacts close to the city, and the Atwater Kent Museum was chosen as the repository. The initial argument had good intentions. Artifacts dug in and around the “old city” should be kept in the city, or so the thinking went. The city and its benefactors know how to best care for the artifacts that represent a real physical connection to the City of Brotherly Love’s rich and storied past. Unfortunately, a number of catastrophes were to beset the collection in the following years. Multiple moves, exposure to the elements, a break-in and boxes emptied of their contents plagued the collection. The passing of key individuals responsible for some of the early digs, and disagreements over the ownership of field records of still other projects has hampered efforts to reunite the associated documentation with the artifacts and severely compromises the scientific value of the collections. Over the past several weeks The State Museum of PA and the Atwater Kent Museum have teamed up to make the best of this unfortunate situation. 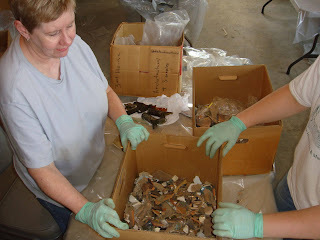 Artifacts have been teased apart into their respective projects, re-bagged and placed in new, clean cardboard boxes and shipped to Harrisburg for processing. The next step in the process will be to track down any and all associated documentation that may still exist in a number of institutions – itself a monumental task. Joining the artifacts with their records will restore the true value to these pieces of Philadelphia’s past. For the past 2 weeks, a team of volunteers and employees from the State Museum, Section of Archaeology and the Atwater Kent have been busy preparing to transport collections from Philadelphia to Harrisburg for curation. The State Museum is currently in the process of transferring these archaeological collections from the Atwater Kent Museum, now called the Philadelphia History Museum, to Harrisburg. 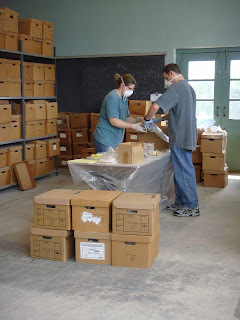 The poor condition of the collection required numerous hours of work to re-bag, re-box, and re-organize the vast amount of artifacts and will require many more hours to process the collection once it all arrives at the State Museum. 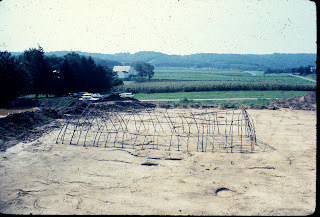 The Atwater Kent was a repository from the early 1970’s till the mid-nineties for archaeological collections excavated from some of the earliest historic sites in Pennsylvania. These collections represent the physical evidence of households from the developing stages of the city of Philadelphia. Prior to the building of new highways and hotels in Philadelphia salvage archaeology was conducted to rescue this heritage and try to interpret the refuse of hundreds of years in an urban setting. The artifacts were housed most recently in a warehouse which the city has now identified for an alternative use and they no longer could care for these collections. 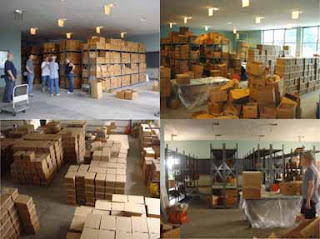 The project began with 1375 boxes found in various states. While in storage, the collection was exposed to environmental damage including rain, animal infestation and cases of vandalism. Thus, a primary concern was to re-box the artifacts and get the collection fit for rehousing. After evaluating the best way to tackle the immense task, the team began by organizing the boxes loosely according to projects. 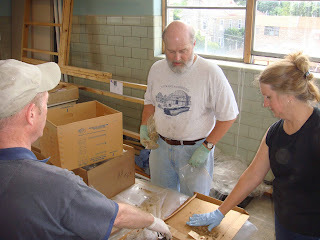 Many of the boxes and bags that contained the artifacts were deteriorating. So the objects needed to be rebagged into new plastic bags and placed into clean record boxes. However, as we transferred the artifacts into new boxes, any provenience information found on the old box labels or tags attached to the artifacts were recorded along with the newly assigned box number. In archaeology, provenience information is crucial to understanding the context of the object. However, considering the state of the condition of these collections, this was a difficult puzzle to construct. Loose tags and objects were found broken at the bottom of boxes or bags were ripped open and its contents spilled out by vandals. Other times, mixed association boxes turned up no relevant information. Moreover, some artifacts were poorly bagged in things like flimsy sandwich bags. So boxes of heavily corroded metal which were now indiscernible had to documented, photographed and then discarded. As a consequence, it is estimated that up to 20% of the entire collection will not be curated. Whole boxes containing organic material like wood, bone, botanicals and leather will be encased in bags and placed on shelves to isolate any mold spores from contaminating the other boxes and artifacts. By the end of our 2 week stay in Philadelphia, the original 1375 boxes were eventually condensed into 1060 new boxes. We identified about 17 projects including: Blue Anchor Tavern, Head House (New Market), New Market West, Market East (and New Market at Pine St.), Commuter Tunnel, State and Schuylkill (S.I.S), MP, Fort Mifflin, Philadelphia Federal Building, Front and Dock, The Dock (Dock and Creek), Waynesborough (WSP), Pennsylvania Hospital, I-95 Expressway, Vine St., Hertz Lot (not taken in by the State Museum), and Franklin Square. Most artifacts dated from the 18th and 19th Century but items from Pre-Historic and modern times were also found. Artifacts cover a vast assortment of object types. Bone, leather, ceramic, glass, botanicals, metal, architectural features, shell, stone and wood were among the categories identified. Although our work so far is only an initial step in processing the entire collection, an image of historic Philadelphia life was already being painted before us. From the cache of Head House sheep bone to the rich assortment of delicate ceramics and wine vessel lots from the Market East project, the archaeology collection from Atwater Kent poses potential as a valuable resource for researchers interested in studying the heritage of this urban community. Humans throughout prehistory had many materials available for shelter and protection. For early man simplicity largely prevailed, in part due to the environment as well as the strategy required for one to live in that environment. 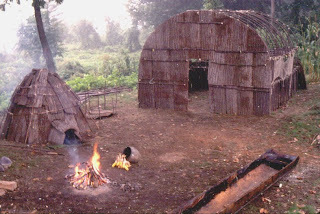 Over time, however as cultures developed strategies for living and sheltering themselves they also had to accommodate the changing environment. Indeed this is where the cliché “necessity is the mother of invention” applies! Here in Pennsylvania, the archaeological record of prehistoric architecture can be traced back at least 8 millennia. Evidence of the variety of shelters people used is found throughout that time. 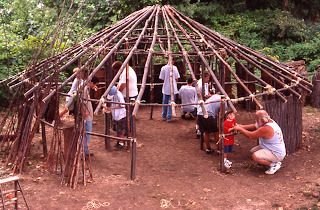 Early shelters were simple affairs constructed to provide temporary cover from the natural elements. Some of these may have evolved from hunting blinds. Natural rock overhangs were also commonly used since little more was necessary than protection from periods of inclement weather. Rock shelters remained in use during the Woodland Period (ca. 500 B.C. – A.D. 1550) as people transitioned from small, nomadic family groups to more formal nucleated hamlets. By the 12th century settlements spread over the landscape as populations grew. The people occupying these settlements eventually became more sedentary as more land was necessary for crop production. Warfare became a periodic threat among some of these groups. As competition for dwindling land and resources intensified many began to fortify their homes with encircling palisades of wooden posts. Eventually confederacies emerged which helped to alleviate some of the strife. Many sites dating to the latter part of the Woodland Period allow a glimpse of prehistoric architecture. Unfortunately, these sites provide only a two dimensional view via the post molds. Post molds or stains are created by the decomposition of what was once a wooden post. These stains are the evidence of house frames, defensive walls and many other structures designed and built by early occupants of the Keystone State. Several years ago as part of “Archaeology Month in Pennsylvania” the Pennsylvania Historical and Museum Commission recreated several house types on City Island. The recreations were largely based on excavation data obtained from two archaeological sites –Martin Site (ca. A.D. 1000) a Clemson Island / Owasco hamlet located in Tioga County; and the Foley Farm Site (ca. A.D. 1585 – 1615 / 1635) a Proto-Contact Monongahela settlement located in Greene County. The information obtained from these sites and the subsequent recreations provide an insight into the diverse living conditions of two distinct Native American groups occupying different parts of Pennsylvania prior to European contact. In June of 1710, a delegation of Tuscarora Indians was dispatched from present day North Carolina to deliver a set of wampum belts to the Governor of Pennsylvania. The delegation was seeking permission to relocate the tribe to Pennsylvania to avoid a war with colonists in North Carolina. The meeting was held on June 8th at Conestoga Town, Manor Township, Lancaster County where representatives sent by Lt. Governor Gookin and the Provincial Council met with the Tuscarora. The Tuscarora carried eight wampum belts symbolizing their desire to have safe lands for their children to play and young men to hunt, protection from slavery, freedom to travel in order to gather wood, food and water, and that they might find peace with their neighbors and the Provincial Government. The Governor and his representatives acknowledged the plan of the Tuscarora to live peaceably and granted them a safe place to live. After some discussion, members of the Iroquois confederacy invited the Tuscarora to move to their lands in New York. War delayed the move but following its end in 1713, the tribe started migrating north through the Susquehanna Valley. The Tuscarora Nation was admitted to the Iroquois confederacy “on the cradleboard” in the early 1720’s but the move lasted over 50 years. To commemorate the 300th anniversary of their journey home, the Tuscarora Nation is sending some of its young men to retrace the steps of their ancestors along the trail. At 11:00 on June 8, 2010, the Pennsylvania Historical and Museum Commission will host a ceremony in Memorial Hall to honor the meeting at Conestoga Town held 300 years ago. Officials from the Nation, including a Clan Mother, will be present, along with some of the individuals who will walk the route from North Carolina through Pennsylvania to New York. Featured will be a party of Tuscarora dancers who are renowned as the best of the Iroquoian dancers. The Tuscarora are Iroquoian speakers. In their sojourn through our state, the Tuscarora left a lasting legacy which honors their nation in the names of towns, streams and mountains. The Commonwealth appreciates their contributions to our heritage and wishes to strengthen our ties with the Tuscarora Nation. The Tuscarora Indian Nation is a federally recognized tribe, acknowledged by the Federal Government as having a government to government relationship with the United States. The meeting at Conestoga town 300 year ago was the beginning of a new life for the Tuscarora Nation. It is part of their heritage and also a significant part of the Commonwealth’s heritage. We feel this is an exceptional opportunity to celebrate the cooperation between the Commonwealth and the Tuscarora Nation in the same approach as our Provincial Government 300 years ago.